I hope you've not forgotten us... It has been about five years since we left Europe. Morgan, my oldest daughter, and fiddle player for our band (Musselwhite Family) is currently on scholarship at East Tennessee State University (ETSU) in the bluegrass program. She is a sophomore (second year) and working with some incredible musicians. Right now her teacher is Hunter Berry (fiddler for Rhonda Vincent). She has great memories of her time in Europe traveling and performing with her family at many of your concerts, and now she would like to come back over for tour with her current band of ETSU students. They are looking at early January next year, just before semester starts up again. I'd like to know what might be available, who has interest in booking them for some shows - I know they'd love to do Schütte-Keller in Deutschland, something in Spain, Scotland, etc... Any contacts you could send would be appreciated. Ernie & Debi Evans, whose 'Sunday Afternoon Breakdown' radio show was featured on the European Bluegrass Blog on 21 October 2009 under the title 'Good morning Europe', announce that from this Sunday, 28 Feb., the programme will be streaming live on the internet from 3.00 p.m. to 6.00 p.m. EST, and can be accessed through this link. Contact Ernie and Debi by e-mail. The 2010 festival is scheduled for 2-5 September, at the usual location, Kemble Airfield, and will feature the Peter Rowan Bluegrass Band (Jody Stecher, Keith Little, and Paul Knight), the Claire Lynch Band, and Jack Lawrence, all from the US. The UK lineup is no less prestigious with local heroes Bill Smarme & the Business, the Scoville Units, Salmagundi, the Thunderbridge Bluegrass Boys, the Slowdown Boys, and a lot more to be confirmed. Concerts will take place on two stages, with the main stage programme starting on Friday at lunchtime. The festival is also in negotiations with a top folk act for a separately billed concert on the evening of Thursday 2 September. All the usual activities - dance, instrumental seminars, tuition tent - will be on the programme and we have placed our order for sunshine! Tickets are on sale and a booking form is available on the website, where you can also keep up with the latest news. Please also consider joining our festival forum if you want to make suggestions and comments about the event, it's your event too! There's a link on the website. Details of the Peter Rowan Bluegrass Band can be seen here. Lilly of the West will perform at the Sofia City Art Gallery on 16 March, joined by Paul O'Shaughnessy (fiddle) and Larry Egan (accordion) as special guests from Ireland. Paul O’Shaughnessy has been a member of the legendary folk band Altan for several years. Larry Egan is featured on the acclaimed Kitchen recordings. Lilly of the West will feature Lilly Drumeva (vocal, guitar, fiddle); Yasen Vasilev (guitar); Svoboda Bozduganova (upright bass); Michail Shishkov (piano, dobro guitar). The concert is part of the Sofia Municipality Chamber Concert series. For further information please see Upcoming Events on the Irish Embassy website or contact Lilly Drumeva by e-mail. Lilly's original announcement (with band photo and St Patrick's Day decorations) can be read here. A reminder that all entries for the eighth edition (2010/2011) of the EBMA's European Bluegrass Directory should be delivered to Thierry Schoysman not later than the end of this month, which is also the end of this week. More details appeared on the EBB on 14 January 2010. Contact Thierry by e-mail. BANJO TOUR! Hailed by the Wall Street Journal as 'the best ever banjoist in the history of Irish music', Gerry O'Connor will be on tour beginning March, in support of his most recent recording, High up - low down. The new CD features Gerry's unique treatment of Irish traditional music, American bluegrass, and ground-breaking new compositions. Gerry's tour begins on Tues. 2 March at Whelan's in Dublin. Performing with him at Whelan's will be well renowned guitarist Tim Edey. Tickets €22. Doors open 8.00 p.m. Not to be missed! 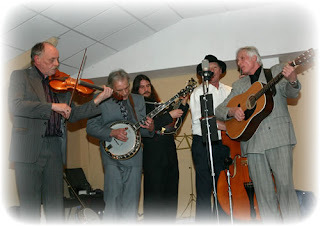 The above photo shows Gerry O'Connor (standing, centre) in the finale of the 2008 Johnny Keenan Banjo Festival in Longford, Ireland; other banjoists visible are Barney McKenna (godfather of Irish tenor-banjo playing), Peter Wernick, and Bill Whelan of the Rough Deal String Band. Chris Keenan, who founded and organises the festival, was among those taking part in the recent European Bluegrass Summit. Attached please find all the information for 'The Red Wine Bluegrass Party #2', which will take place at Teatro della Gioventù in Genoa (Genova), Friday 19 and Saturday 20 March, 9.00 p.m., with special guests from San Francisco Laurie Lewis & Tom Rozum! (from Tuesday to Saturday 4.30-7.00 p.m. The website of regional bluegrass association 'Bluegrass in Basel' has been updated to include a nice gallery of photos, taken by Beat Schmid of Switzerland, of the Bluegrass Jamboree 2009 festivities which took in place in Basel on Sunday 13 December 2009 - the only show in Switzerland of Rainer Zellner's tour. Tentative plans are to have the Jamboree back in December 2010. And here's the link. More details, including links for online booking, are here. 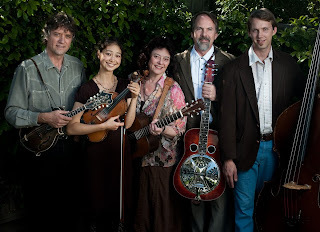 As posted last month and on 3 Feb., the Kathy Kallick Band bring their brand of 'hot bluegrass & cool originals' to Europe in May 2010. Kathy previously toured Europe four times with the Good Ol' Persons and twice with the Kathy Kallick Band. Kathy and the band will bring with them a brand-new album, Between the hollow & the high-rise, with a number of new Kathy compositions and significant contributions from everyone in the band. For this tour, Kathy is joined by band members Dan Booth (bass, vocals), Greg Booth (dobro, banjo, vocals), and Annie Staninec (fiddle), plus special guest Martino Coppo (mandolin, vocals). The band performs Kathy's song 'Wildflowers' on 30 Aug. 2009 on YouTube. The band's electronic press kit (with five tracks from their forthcoming album) is here. Thank you & please don't hesitate to contact me for additional information and/or to inquire about bookings. The Danilo Cartia Band (Italy), led by banjoist Danilo Cartia, will be playing at 22:00 on 18 Feb. 2010 at the Cantine Blues, Via della Batteria Nomentana, 66/68 Rome. Admission free. Info: 349/6694810. * To exchange information about existing local projects to provide tool kits to each other. * Festivals (including sponsorship and legal issues) and the promotion in the US of bluegrass from Europe and other non-US regions. A bluegrass concert starring Blackjack (CZ), sponsored by the city of Bühl and provided free of charge to the Summit and its participants, was held on Saturday 6 February at 8.00 p.m. in the Schütte-Keller, a focal point of bluegrass activity in Bühl. Many photos taken during the Summit, a report by Friedrich Hog (in German) on the Blackjack concert, and coverage in the local press can all be seen here. Bill Monroe, with his respect for the 'ancient tones', might approve of this influence from eighth-century Europe on a modern American instrument. Larry Robinson of California is an acknowledged master of inlay work on musical instruments. His latest project is inspired by one of the art treasures of the so-called 'Dark Ages' - the Book of Lindisfarne, a copy of the Four Gospels, written and illuminated by the Anglo-Saxon bishop Eadfrith (d. 721) of Lindisfarne, north-east England. Robinson studied Eadfrith's style and technique in minute detail before translating the scribe's artistry into inlay on a guitar. A detail of the back is shown in this photo; more photos of the instrument and the work in progress are here. Thanks to the Bluegrass Blog for this news. Heidelberg Bluegrass Stammtisch hosts Chris Weller and Patrick Russell warmly welcome you to join us to our monthly bluegrass jam at the local Rod & Gun Club, 11 Feb. - starting about 7.00 p.m. We welcome all area bluegrass musicians from Frankfurt to Stuttgart, and from both sides of the Rhein River, to join us for the only bluegrass jam of its kind in Germany. The best thing for you - it's free! That's right, musicians from four or five local bands join together to enjoy a jam together. The restaurant will serve food and beverages as you like, including an American-style hamburger. 11 Apr. 26122 Oldenburg - The Gibson Brothers, from upstate New York. I have seen this band perform and the show is first-class. They have five or six CDs to their credit, with Bona fide a wonderful work. The Staatstheater is a super venue for music. 14-15 May 77815 Buhl International Bluegrass Festival. A beautiful town near Baden-Baden and six bluegrass bands - three USA and three European bands - offering two days of bluegrass music enjoyment. A must-see. If you require more information, please let me know. Hope to see you Thursday night at the R&G. Grass on! You are invited to an evening of bluegrass music with the Sons of Navarone, one of Europe’s top bands. This Belgium-based bluegrass band have been in existence since 2001 and since then they have successfully taken part and left their mark in many parts of the European music scene. These guys stand for WYSIWYG (What You See Is What You Get). 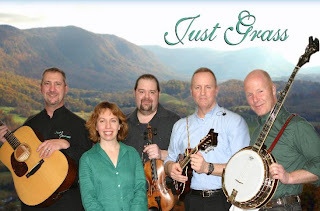 Well played acoustic bluegrass music, with outstanding close harmony singing that has become their trademark. The Sons put on a great show with their interactive rapport with the audience and their onstage humour keeps the audience sharp and on the edge of their seats. 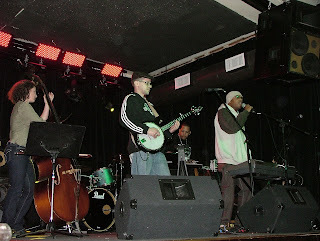 As well as traditional and contemporary bluegrass, the SONS also perform songs from other musical genres but giving them their own special bluegrass arrangements. Full details on the Sons' website. Thanks to Dave Morris of the MORRIS BOYS writing to our organisation informing us all of the death of Jerry Alsford. 'Jerry was in our bluegrass band from the early 1970s until a few years ago. Jerry was one of the best bluegrass fiddle players in the UK until his untimely passing only a few weeks ago. He was a player that came out from the classical field into bluegrass with honors. He did his bluegrass apprenticeship with our band under the guidance of Trevor and Glyn Morris and Dave Hatfield and myself. He worked with the SOUTHERN RAMBLERS, another of the early British bluegrass bands in the 1960s who helped shape bluegrass in the UK for a period of time. He rejoined the MORRIS BOYS after being a pro fiddle player with a country band on the circuit, but his love of playing bluegrass with our band led the way for the Morris brothers minus Trevor, who is currently with MATCHING TIES by the way, to play at all the major UK festivals and US festivals in Rosine, Kentucky. He found happiness in his retirement after being a technical-commercial artist in his new canal boat called 'Roanoke', in which he traveled the UK until his passing. Jerry will be sadly missed by the many friends in the business who played alongside him and not forgetting his family and close friends in Leigh-on Sea, Essex, England. The old-time classes are doing reasonably well but are still low on numbers, especially the fiddle. If you are planning to book, please let us know of your commitment as soon as possible please. We could do with about seven fiddle students and five banjo students to make things work out. Bluegrass fiddle is looking a bit sad as well this year, and if you fancy learning how to play the fiddle without retuning every five minutes (no offence intended towards the OT fiddlers! ), why not have a go with Brian Wicklund on the bluegrass fiddle course. Brian is a great teacher. Other courses that could do with a boost are singing (Chris Stuart and Janet Beazley), Bass (with Eric Thorin) and Autoharp (with Cathy Britell). Stewart Williams has had to pull out of teaching this year due to personal reasons outside of his control. We will be replacing him with a small team of tutors but the course will be taught as a group. Finally, I’m pleased to announce that Mike Compton has agreed to take on a second class of mandolin players. Mike is probably one of the best exponents of 'old-time' mandolin playing around; and if you play the instrument in an old-time setting, he comes highly recommended. In closing, I just want to remind people that we are able to run classes with low numbers as those that fill up (like bluegrass banjo for instance) allow us to offset the losses. That is what has happened in the past when old-time classes have not attracted enough students. But with a recession and people quite understandably worried about their jobs, bookings are generally down across the board, that cross subsidy is less available to us. So we do need your continued support. Thanks to Adrian Trbovich of the Turbo Pro Project for this information about an upcoming tour next year. 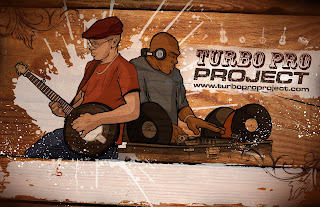 The Turbo Pro Project, a cutting-edge act that features a banjo player and DJ, is planning a 2011 tour of Switzerland, Germany, and possibly France. They are open to festivals, house concerts, and other venues. Solicitations are welcome from venues and promoters. For more information visit the Project website. All inquiries can be submitted to Adrian by e-mail. Suzanne and Jim (USA), whom many will remember from their appearances at the EWOB Festival and elsewhere in Europe during 2007, send Glorious Ground Hog Day greetings to their friends, together with the news that they can be seen playing 'Si bheag, si mhor' here - the first upload on their own YouTube channel. Norway, France, and the Czech Republic would tie for the top 10 with just a couple more pro members. We have pro members in 22 countries and are especially proud of our 1 member in South America (Brazil). I believe he has more square miles to cover than anyone! Thanks to Timo Hannula, artist director of Haapavesi Folk, for the news that Mike Compton (USA) and David Grier (USA) will be at the Festival from 28 June to 4 July 2010, teaching and performing. Mike Compton is the acknowledged master of mandolin music in the style of Bill Monroe, and David Grier is a three-time winner of the IBMA Guitar Player of the Year award.